Parent Conferences always give me some sort of anxiety. Maybe it’s because I haven’t formed a strong relationship with the families yet or the fact that the parents are getting used to the new curriculum and all of their emails have me feeling scared. But I’m here to tell you that they don’t have to be scary…really. I’ve talked about this a few times because I believe that parent relationships are seriously the key to a great year! I’ve got 3 tips that have helped alleviate some of my conference anxiety. I’m a big planner and I decided that if I don’t know what to expect, I can’t plan for it. And that scares me. Does that make sense? Can you relate? So, after a few conferences where I felt like I was bombarded with questions that I wasn’t prepared to answer, I created a pre-conference form. This form is a game changer I tell you! I send it home 2 weeks before conferences so I can prepare accordingly. Just today, I got one back that said “I would like to discuss all of my child’s behavior letters that have been sent home.” That lets me know that I better to have all of those letters ready in time for this conference. Parents like this form because it gives them a voice and shows them they are active participants in the conference and I’m not running the show. Want a copy, just click on the photo and save it! We had a very heated discussion with my grade level today about what data should be shared at conferences. All of the parents on my grade level said that the bottom line is this: Parents want to know where their child is at and where they need to be. Simple. I’m not a parent, but definitely agree as every parent I’ve conferenced with wants to know the good stuff. And there’s always that parent that wants to know where there child is in relation to the others in the class. Please parents, stop asking that awkward question! I digress. Create some sort of table that lists Subjects or Assessment Data. 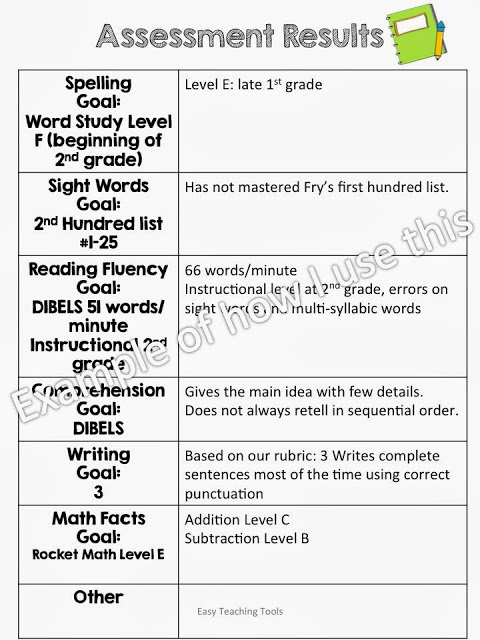 I use Word Study in my class and in the past, listed the goal for this point in the year. However, now that we use Standards Based Report Cards, I list the end of the year goal. On the right hand side, I list where the student is at and any notes. This page is the bread and butter of the conference, in most parent’s opinions. I like to give parents a little task while we’re conferencing. I always start out the conference with things the child does well. In the past, I would type them up ahead of time. That took forever so I changed my ways and got smart. So now, I give this little form to parents to they can take notes on the things the child is doing well. It’s great to start out a conference with the positives, then throw in a few things they kiddos can work on, and end with another positive. Parents get so busy asking questions and listening to what they’re saying that they sometimes forget what was discussed. 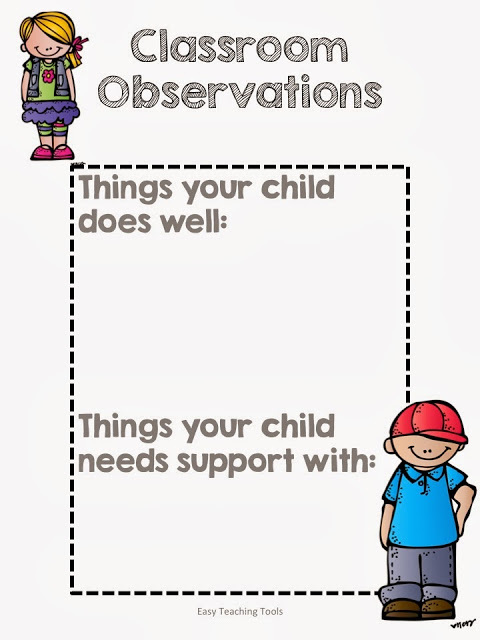 This little cheat sheet is great for them to refer back to as well as talk to their child about what they’re rocking at in class and what they need some support with.